saw this in houston. think it's a good deal? 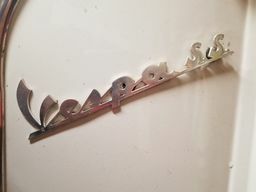 Guy says he had it shipped from a shop in seattle. took it for a spin and seemed to run pretty solid. paint is definitely original but had a couple patches that were rattle canned. 28 days on CL? Surprised it's still for sale. 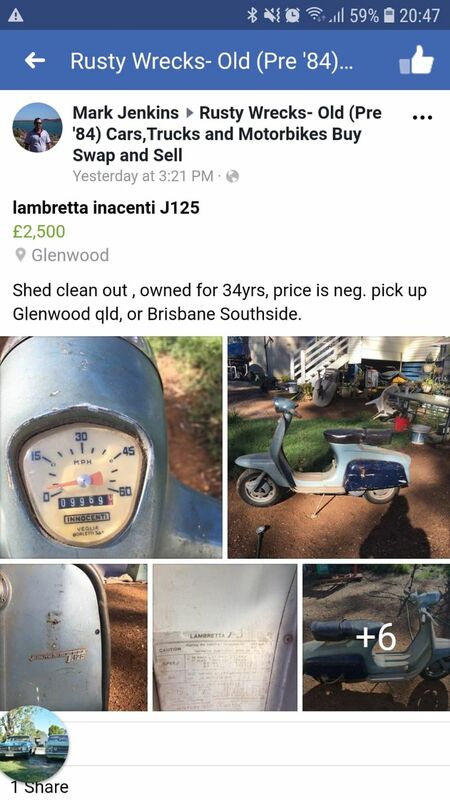 But this is probably the worst time to sell a scoot. I'm not into smallframes, but that price does not seem that far off. Did you end up trading it for a P as you'd hoped? I ended up selling it for about double what I was asking. Will buy a P with the funds when the right one comes along, keep me in mind if you see any good ones! I took a look myself. It's not bad. Mostly original. The right side floorboards need to be re-welded to the brace underneath. The forks look pushed back to me. Others may have a better eye on the fork situation and chime in. I don't know if this s a deal or not. 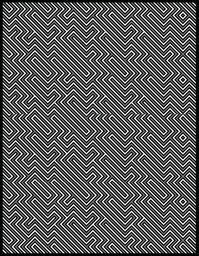 I don't have time to look where it should be posted but it's cool. 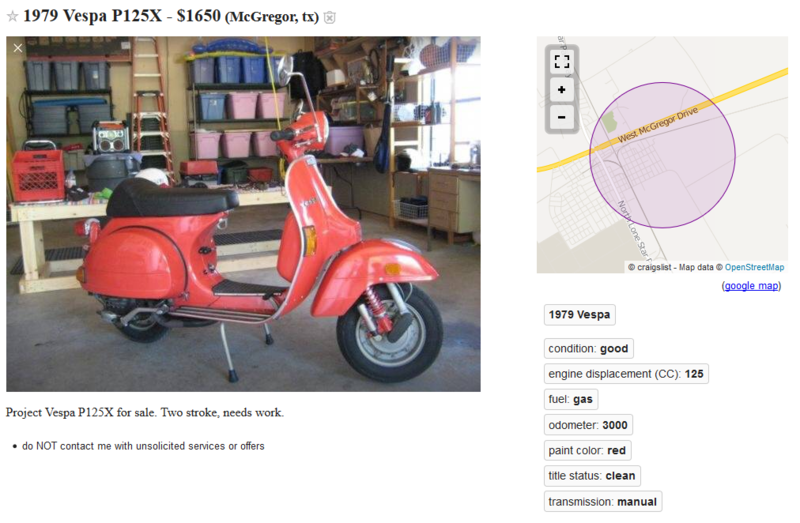 '67 GS150, huh? Uh oh. I smell a fish. Not very very cheap but could be a good deal. 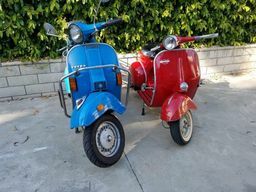 Two smallframe Vespas in mid Florida. 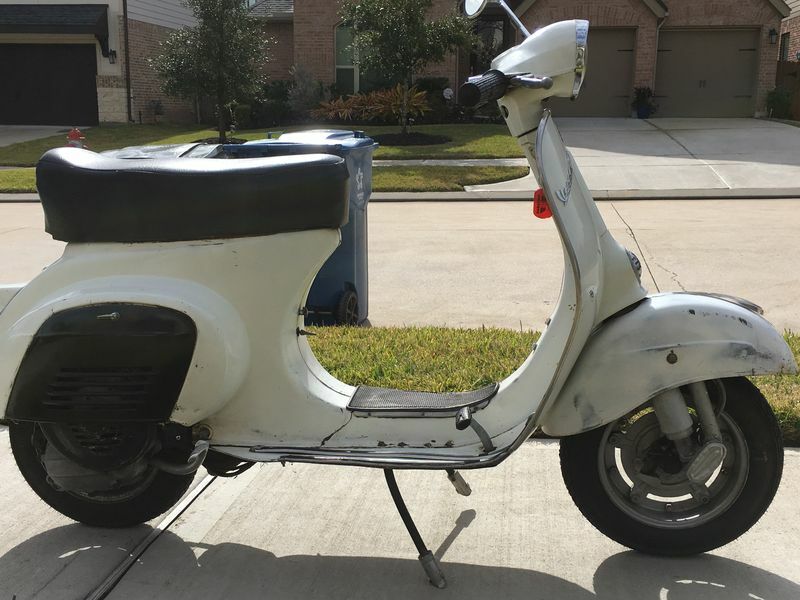 Since were talking smallframes, this 1982 Vespa 50 Special with a kitted motor is not bad for $500. Frames busted but a frame could be found or go the Gt6MK3 route and build the frame back up. 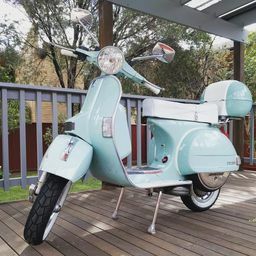 http://modernvespa.com/forum/topic159075. 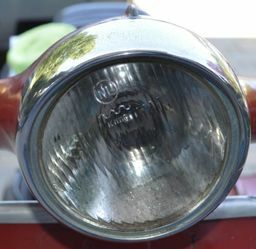 Won't have the problem of the horn cast not fitting. OK, last one for the artistic folks out there. This P (don't know the cc's) is only $795. It's really geared up. 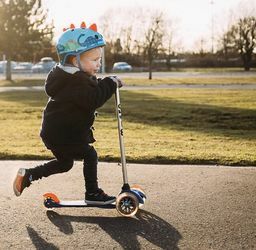 But seriously, this scoot could be a "primary driver". Don't forget to leave a tip in the tip jar and I'm here all week. Goodnight everybody. Smallframe project $150. 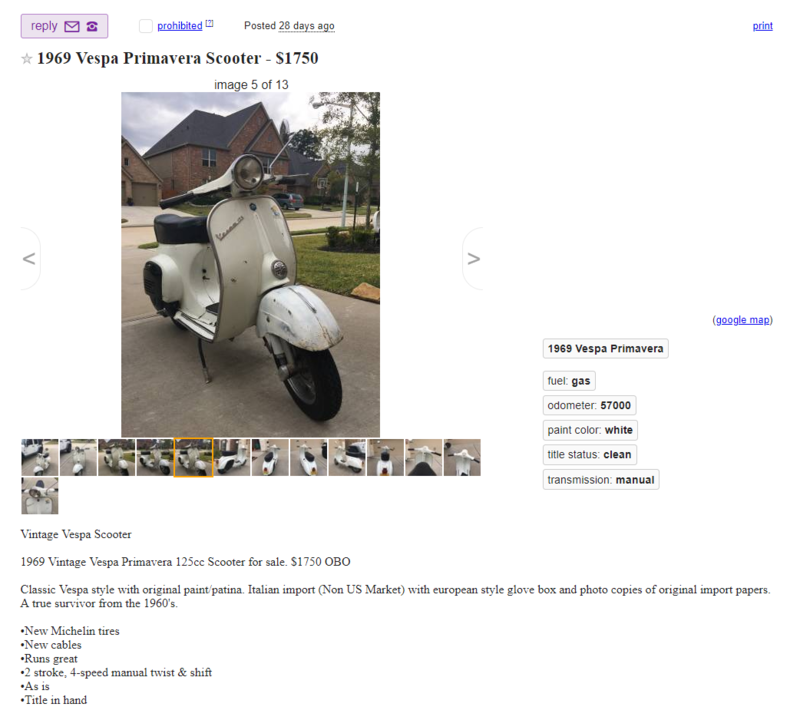 Shipping would cost more then the scooter. That’s top dollar for a non working P125. I’d keep looking. Join the group for details. That's all I know. 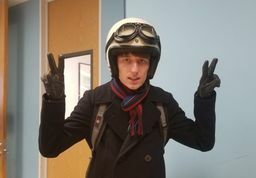 That’s not a vespa and the J range is not a desirable Lambretta. Not sure if it’s value but I wouldn’t be interested. I ended up paying $1400. I actually found that it runs quite well. 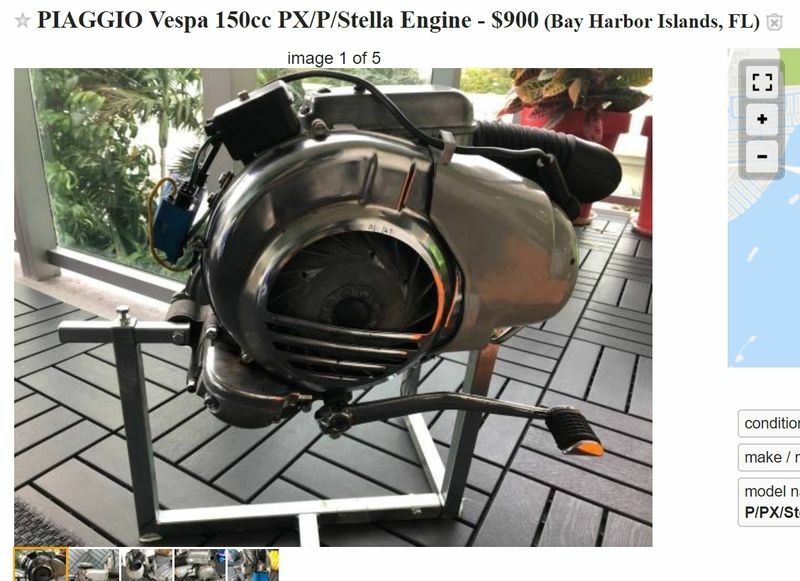 The owner was an older guy that doesn't know much about engines and noticed it wasn't running right and just wanted to sell it. It revs high at idle right now so I'm pretty sure it just has an air leak. But otherwise runs quite well. 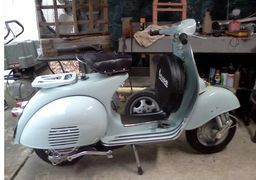 It's got a cylinder kit, it starts in 1 kick, only as 2800 miles, etc. Given all of this, I think it's more fair. Am I still wrong to think this? Now that we know it’s actually running and includes a cylinder kit, $1400 is pretty good! 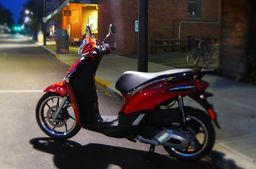 Shame the owner didn’t know his own scoot. Paying $1650 for a stock, non running P125 isn’t a deal of the day and I would have moved onto another prospect. That's an early 3-speed J125. 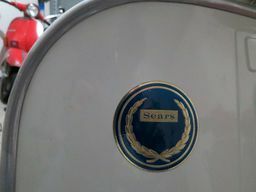 Smallframe Lambrettas are getting a bit more desirable now because of the impending launch of a range of tuning goodies from Rimini Lambretta Centre / Casa Performance. However, it's still only worth around half of what's being asked for it. Not my thing but bloody cheap. This same guy had a P200 engine awhile back. I talked to him in email and he seems to know what he is doing. Oh, you "talked to him in email"? Well that's a ringing endorsement. Because you have such a good track record buying engines? Next time just buy a running P200 (that you can test drive in person) for under $2k. I have a feeling there will be a next time.